Congratulations to Tabitha who won the Arby’s gift card giveaway. Arby’s has always been my favorite fast food restaurant. I love that even when in a hurry, you can still get a great meal at Arby’s. Just in time for the hottest days of summer, Arby’s has introduced a new sandwich to help fill you up while keeping you cool. The Arby’s Angus Cool Deli Sandwich starts out with an authentic Italian roll piled high with lean, sliced, Angus beef and Swiss cheese. It is then topped with crisp lettuce and tomato, diced banana peppers and pickles. And all finished off with vinaigrette and mayonnaise. You can even get this in a wrap or with whole grain flatbread. I tried the new Angus Deli Sandwich and I was not disappointed. The Angus beef was perfect and the sandwich was the ideal hot summertime lunch. One lucky Yellow Tennessee reader will win a $20 Arby’s gift card to try the new Angus Cool Deli Sandwich. Mandatory Entry: Tell me your favorite item to order from Arby’s. * Tweet about this giveaway. 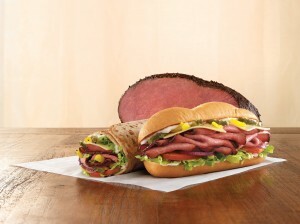 #Win a $20 Arby’s GC and cool off with the Angus Cool Deli Sandwich http://yellowtennessee.com/?p=1979 #Giveaway. One entry per day. Entrants 18 and older and from the US are eligible. Contest Ends on August 9, 2011. Winners will be chosen by And The Winner Is and announced around August 10th. Winners will be notified by email with “You Have Won the Arby’s Giveaway” in the subject line. Winner will then have 48 hours to respond before a new winner is chosen.